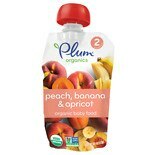 Shop Plum Organics Organic Baby Food Peach, Apricot & Banana (4.22 oz. )4.22 oz. 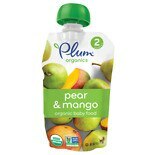 Shop Plum Organics Organic Baby Food Pear & Mango (4.22 oz. )4.22 oz. 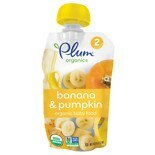 Shop Plum Organics Organic Baby Food Pumpkin & Banana (4.22 oz. )4.22 oz. 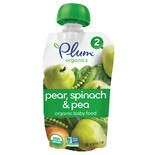 Shop Plum Organics Baby Organic Baby Food Spinach, Peas & Pear (4.22 oz. )4.22 oz. 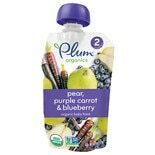 Shop Plum Organics Baby Organic Baby Food Blueberry, Pear & Purple Carrot (4.22 oz. )4.22 oz. 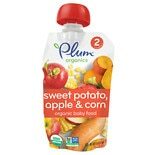 Shop Plum Organics Baby Organic Baby Food Sweet Potato, Corn & Apple (4.22 oz. )4.22 oz. 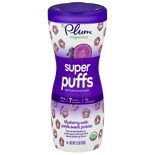 Shop Plum Organics Baby Super Puffs Fruit & Veggie Grain Puffs Purples - Blueberry & Purple Sweet Potato (1.5 oz. )1.5 oz. 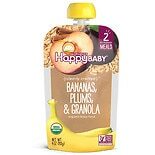 Shop Happy Baby Clearly Crafted Organic Food Pouch Banana, Plum, Granola (4 oz. )4 oz. Take the natural route for your baby's vital nutrition when you select Plum Organics products. Drop clunky glass jars for BPA-free pouches that are easy to pack and go when you select Plum Organics Baby Second Blends. Stock up and save on your baby's favorite selections with the Plum Organics 6-pack options. Try new flavors by purchasing single packets, or sample the wide selection of fruit, veggie and grain snacks. If you want selection, Plum Organics is your choice for organic baby foods. Combining a range of flavors, such as corn and apple, peas and pears, apples and carrots, sweet potato and even spinach, these baby foods are great for introducing your little one to new food flavors. When baby formula is no longer enough for your growing baby, Plum Organics has options from Stage 1 single fruit and vegetable blends through to Stage 3 training meals and all the snacks in between to keep your baby satisfied.